I personally love heights and don't experience much fear. I wish that I had more of a fear of heights and a bigger adrenaline rush, but high places just don't do it for me. I used to be a high ropes instructor and would sit in the trees for hours coherence young children to climb higher, or slide off the zip line platform. Oh how I miss those days. This summer I had 'One last blast' as a volunteer counselor at the camp where I spent my college summers. The theme for Photo Friday is Fear! 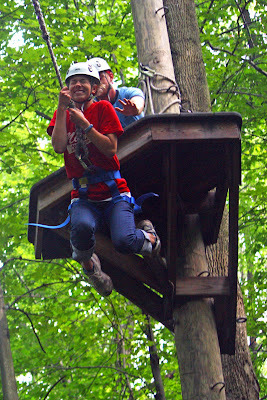 In this picture my co-counselor is leaving the platform on the zip-line. That would be me, but I think my daughter would love it! Thanks for stopping by my Thunder Mtn post. I did not use a tripod, I didn't even have a DSLR. I used at that time a Canon S2-IS camera and the railing that is along the walkway. I was never one for carrying a bunch of stuff in the parks, so I never got there with a tripod. I've got one in my car now, but still haven't used it! Carly: That is a neat capture of the fear facture in the jump. Thanks so much for your comments. It is rather interesting for me to read this article. Thanx for it. I like such themes and anything that is connected to this matter. I definitely want to read a bit more on that blog soon.